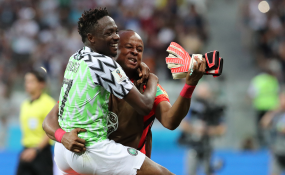 Asaba — Super Eagles' Captain, Ahmed Musa has assured Nigerians that the team will not underestimate Seychelles when they meet in their last Egypt 2019 African Nations Cup qualifier today at the Stephen Keshi Stadium, Asaba. Musa says the team want to get the three points to end the series on a good note. According to Musa, "the Eagles are ready for today's game. We are here to win. The players are in high spirit and they want to continue putting smiles on the faces of Nigerians." The Eagles, who had their final work out yesterday evening under floodlight at the Stephen Keshi Stadium, said they were 100 per cent focused in the bid to win today. After dividing the players into two groups at the beginning of last training session, Coach Gernot Rohr took the players in a rugby style exercise before going into tactical training and free kicks. The assistant coach, Alloy Agu took South Africa-based goalkeeper, Daniel Akpeyi on a special drilling session outside the pitch, while Francis Uzoho and Ikechukwu Ezinwa manned the posts for the two sides on the pitch. Meanwhile, Seychelles Coach, Gavin Jeanne has promised that his team will give Nigeria a run for it money in today's game. He said playing against a big team like Nigeria will give his boys enough motivation to raise their game, adding that the match is part of the developmental process for Seychelles football. "We are here to play good football despite not qualifying for the Egypt 2019 Nations Cup. "Playing against one of these big teams in Africa with talented players playing for top clubs in Europe is not an easy task. Our player are amateurs, but that will not stop us from giving our best," he said. Today's session is in fulfilment of the final day fixtures of the 2019 Africa Cup of Nations qualifying series. Group leaders Nigeria made sure of a slot at African football's biggest house party in November 2018 after a 1-1 draw with South Africa in Johannesburg, but there is word in the camp that the Nigerian stars are looking to rack up a high-score win for bragging rights. Libya's Mediterranean Knights, who are involved in the other match of the group against South Africa in Tunisia, incinerated the Pirates 8-1 right in Mahé Island in one of the group matches. That remains the highest-score win of the entire qualifying series. In Mahé Island on September 8, 2018, goals by Ahmed Musa (a rocket from his weaker left foot), defender Chidozie Awaziem and Odion Ighalo sealed a 3-0 win and kept the Eagles in the hunt for a ticket to the 2019 AFCON. Wins over Libya home and away and the draw in South Africa took Nigeria to the finals. Today, Rohr will unleash his best legs, as a high-score win would put the Eagles in good and great mood for Tuesday's prestige international friendly against seven-time African champions Egypt at the same venue.